Greens Pool in William Bay National Park, Denmark, Western Australia. 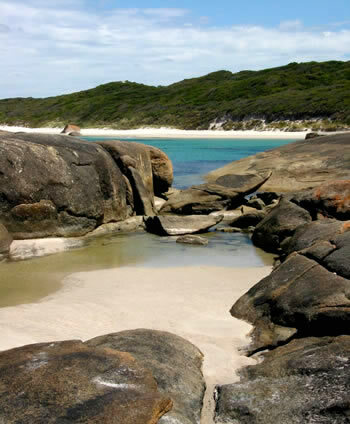 Fifteen kilometers to the west of Denmark is a beautiful, magical beach called Greens Pool in William Bay National Park. Almost completely sheltered from the waves of the Great Southern Ocean by the rounded rock boulders typical to this area, Greens Pool is paradise. Walking into the water, you will notice the long gradual slope, allowing children of all ages to experience the ocean in an safe and comfortable environment. The expansively white beach stretches west, endlessly out of sight, far past the rock guardians of the rock pool across William Bay and Mazzoletti Beach. 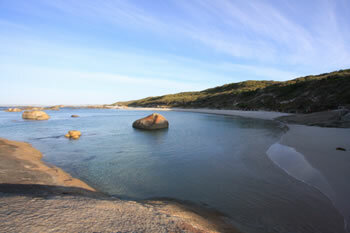 Greens Pool is one of the most popular destinations in Denmark, WA. Greens Pool is a popular snorkelling beach with many fish to be seen amongst the rocks and coral on the inner side of the rock breaks. 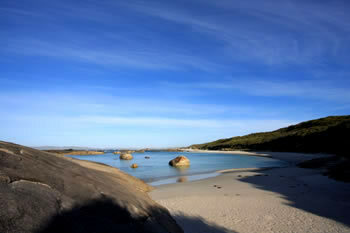 The eastern end of William Bay National Park includes Greens Pool and Elephant Rocks, and is accessible from the South Coast Highway approximately 14 kilometres west of Denmark. The western end of the park is accessible further down the South Coast Highway via Parry Road and on to Parry Beach with car access to Mazzoletti Beach. PARKING: There are two car parks at Greens Pool and Elephant Rocks. Both have access to Greens Pool, so remember which flight of stairs you descended. Greens Pool is on the William Bay National Park Map Located 15k West of Denmark along the South Coast Highway. Greens Pool is one of the most beautiful locations you will ever see. White sand, turquoise water, rocks jutting from beneath the water. Most people who visit Greens Pool find it truly amazing. Greens Pool beach is white, sandy and has a gradual slope into the mostly calm waters of this secluded beach. A beatiful place to watch a peaceful sunrise is at Greens Pool, Denmark, WA. During the summer months this is a very popular location. Greens Pool is a popular swimming destination. 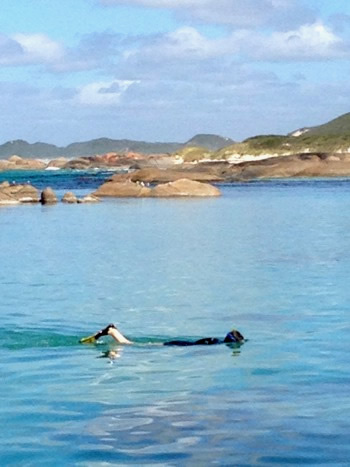 What makes Greens pool so divine? Green’s Pool is surrounded by gradually sloping rock formations cut with small crevasses and pools – perfect for children young and old. The calm waters of Greens Pool are very clearly seen in this video of Elephant Rocks and Greens Pool from Tower Hill. 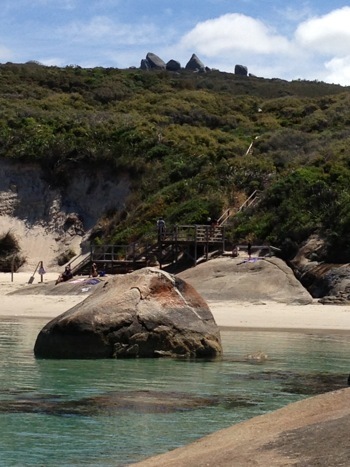 The video starts with the backs of the elephants, and pans west (right) to Greens Pool. On days when the wind is apparent, the rocks make a perfect shelter for enjoying a wind-free day at the beach. Many an adventurer has been seen jumping from the single square-topped boulder in the centre of the pool. If you are in to snorkeling, the wave-less waters make it easy to spot multitudes of fish of all sizes – from hand size schools to large sting-rays. To the east, the sloping rocks increase in size and height as they move towards Elephant Rocks and Elephant Cove just a short walk across the headland. This video shows how calm the waters of Greens Pool are compared to the surrounding waves of William Bay. This video was taken from Tower Hill, far above Greens Pool in the National Park.